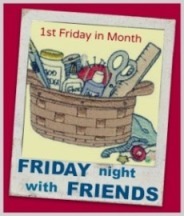 Today was a KQ Girls sewing day - we have switched to one Saturday and one Sunday a month. 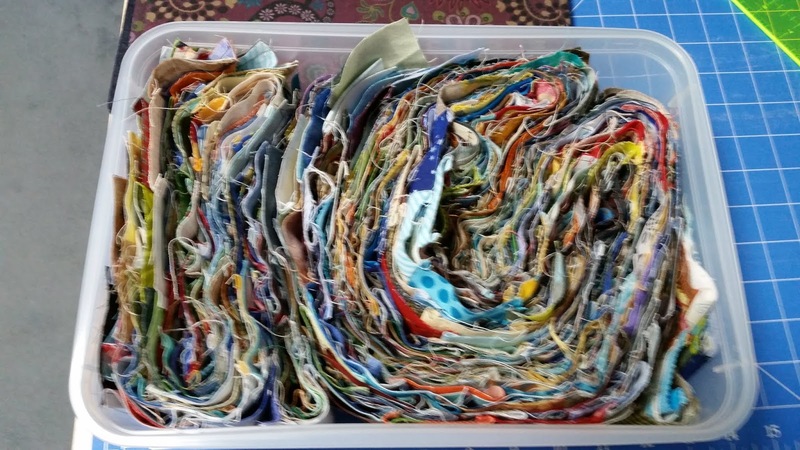 I needed a machine sewing project and decided to take along the 21/2" scrappy squares that I plan to make into a male charity quilt. I made one (finished off a long term project) back in September 2016 - here - and sometime after that I decided I should make a male one, as most charities get a lot of girly stuff. So I have been sewing leaders and enders with that in mind. I had about 18 strips already made that were 32 squares long and another pile that were 20 - and more that I had made into sets of 4....so today I got all the smaller bits and joined and added . . .I now have 46 strips of 32 squares. 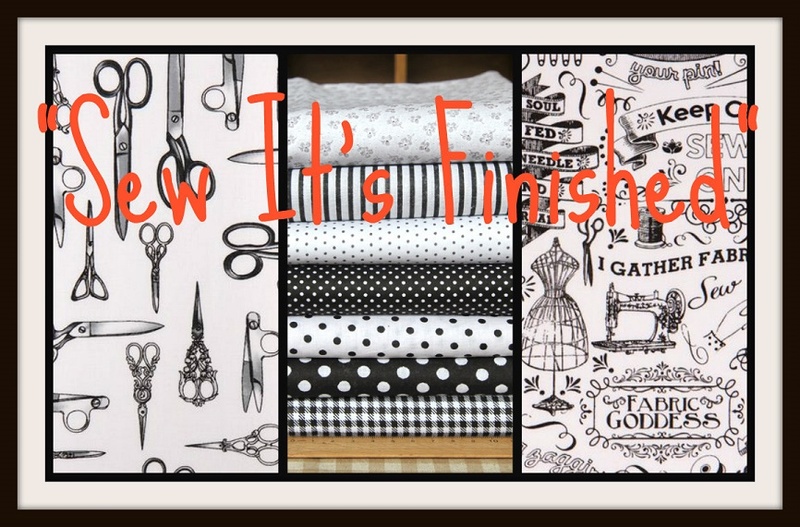 I haven't decide how many rows I will put into each quilt - but I'm sure I have enough for two quilts now.. I do this as my leaders and enders because I use different machines and the seam allowance is not always the same and on top of that, it is fast because I don't need to worry about matching all the seams - I don't want them to become another UFO. 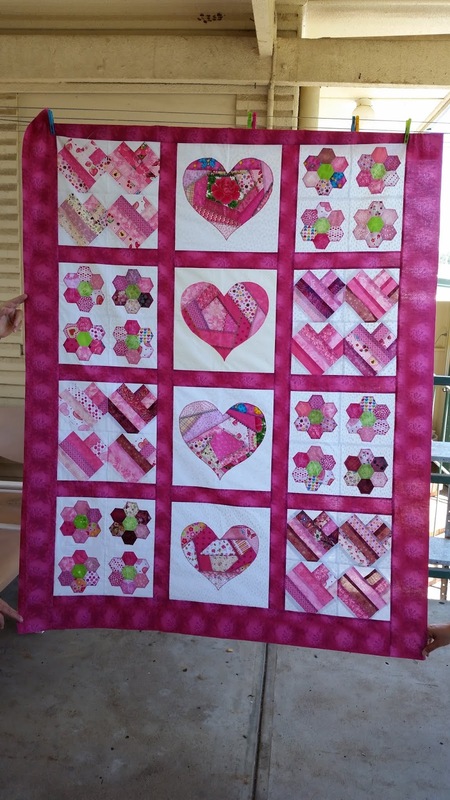 In an earlier post I mentioned how this group had done some mini tutorials and we made numerous blocks with the idea of making a few quilts for charity. One quilt had been put together but we were missing the side borders..and we had almost the right number of blocks to make up another quilt. 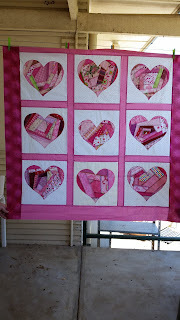 I bought some bright pink on a recent shopping expedition and finished the borders on #1 , made two more big hearts and put #2 together. 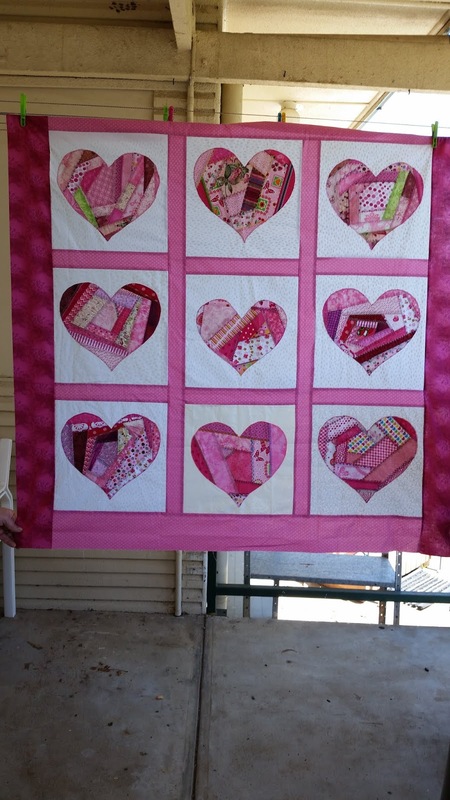 I to\k them along today to show the gang and they are off to someone else for quilting and gifting. 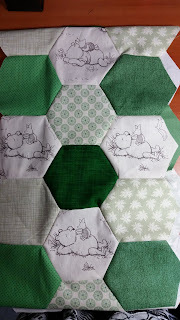 Tonight I thought I better make a start on joining the Winnie the Pooh hexies - I'm sure this baby won't be waiting for me to finish the quilt...but I don't want the child to be 6 months old when I'm finished....I've been putting these together by machine...it is fiddly - it is not quick...but it seems to be working...and - for me - with a finger still recovering - it is much much quicker... (tedious...but music is going in he background). So, not bad for a day's work. And I still have Sunday to go! 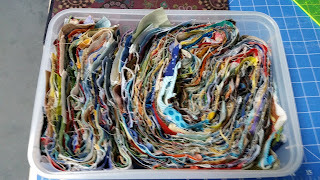 great idea for all those scraps... 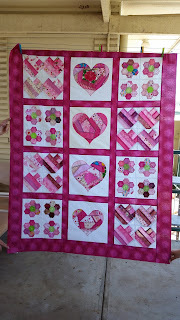 I did like the look with the other fabric in between each strip of squares. Love the Pooh Hexie top..